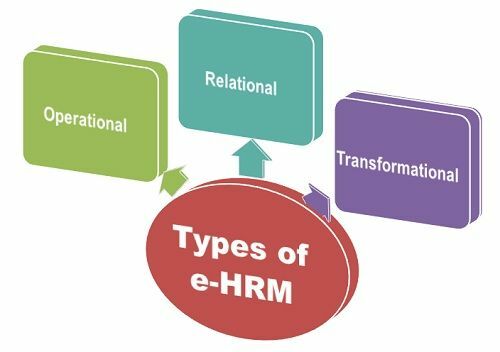 Definition: E-HRM is the integration of all HR systems and activities using the web based technologies. Simply, when HR uses the Internet or related technologies to support their activities, procedures, processes, then it becomes an e-HRM. Through e-HRM, the HR manager can get all the data compiled at one place and can make the analysis and decisions on the personnel effectively. Operational e-HRM: It is concerned with the operational functions of HR such as payroll, employee personal data, etc. Relational e-HRM: It is concerned with the supporting business processes Viz. Training, recruitment, selection, etc. Transformational e-HRM: It is concerned with the HR strategies and its activities such as knowledge management, strategic orientation. 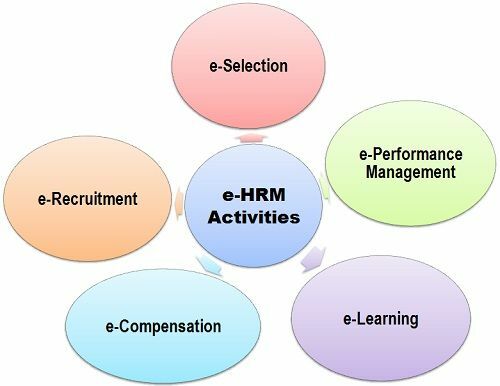 Through e-HRM, the main activities that could be performed online are Recruitment, Selection, Training, Performance Management, Compensation. The detailed description of these activities is given below. e-Recruitment: Also known as online Recruiting, is being widely used by companies these days. Through e-Recruitment, companies usually hire the candidates using the internet as a medium. The common practice of facilitating the online recruitment is by uploading the recruitment information on the company’s official website or hiring the online recruitment websites to serve the purpose. Monster.com, Naukri.com, Timesjob.com are some of the well renowned online recruitment websites. e-Selection: The HR department using the online selection process must ensure that each step complies with the procedural requirements viz. Project steps, vendor selection, assessment steps, feedback to the candidates, etc.The purpose of E-selection is to utilize the maximum human capital at a reduced cost and in less time. E-Performance Management: Many companies make use of web-based technology to evaluate the performance of an individual. This can be done either using the computer monitoring tool, wherein the complete working of an individual can be recorded, or through writing the reviews and generating the feedback on the employee’s performance using the web portal. E-Learning: It means using the internet or organization’s intranet to facilitate the training and development programmes for the workforce. Getting the online modules of training, a large number of employees can be covered irrespective of their locations. E-Compensation: An organization using the compensation management online enables it to gather, store, analyze, and distribute the compensation data or information to anyone at anytime. Also, the individual can access electronically distributed compensation software, analytic tools, from any place in the world. Thus, with the help of e-HRM, the records of all the employees sitting in different geographical locations can be stored and also the new candidates could be hired from any part of the world.